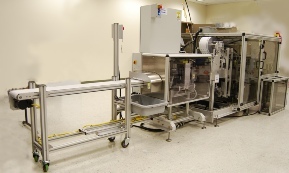 High speed version of the QuickPouch Horizontal - can package 180 pouches per minute. Ideal for small flat items such as test strips, dissolvable strips, breath strips. Standard horizontal form fill seal machine, FFS machine, heat forms - either peelable pouch or standard four-sided seal pouches. The form fill seal machine, will automatically load product into four-sided seal pouches, it is integrated with custom loading options. Finish suitable for medical and diagnostic devices industry requirements. The form fill seal machine has easy access safety guards. Optional printing and vision inspection system. Validateable heat seal. Call us to discuss your application.